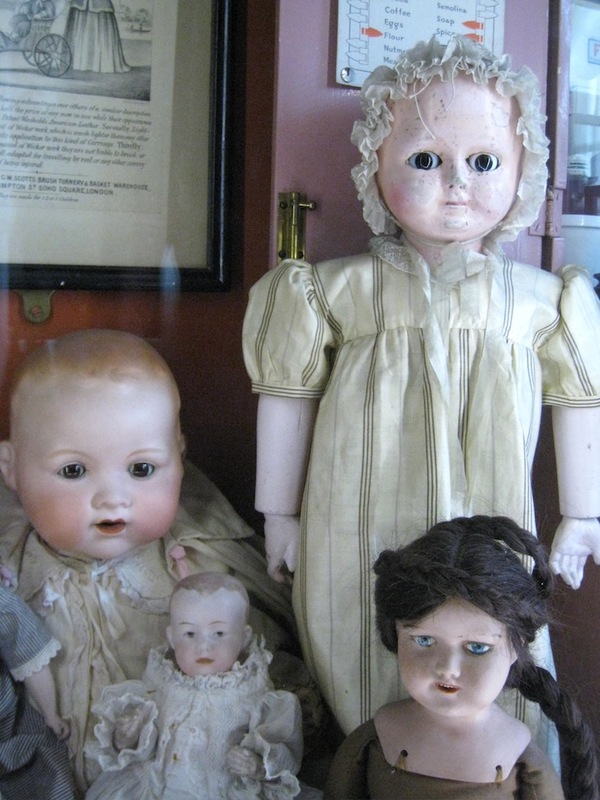 Inside the Pollock Museum, Part 2, the Dolls…. Visit The Pollock Toy Museum hereDolls. Thousands of ’em. When we stepped from the room at the top of the Victorian house (where Sooty and Sweep are) through the hole in the wall that leads into the Georgian house, we met some seriously scary dolls. But we’ll start with the lovely/lovable/loved. And there are lots of those, many dolls with really sweet expressions. My absolute favourite was the Japanese doll with the beautiful face, several gorgeous outfits and her own furniture. One of her dressers is real lacquer. The Billiken doll was some sort of good luck charm. And then there is the cabbage baby (a sort of jack-in-the-box doll), the vaguely weird squeaky dolls (they look as if they’ve just been told off), and the Fräulein with the come hither pose…click on any photo to see the entire image. Then there are the downright frightening. These two share a cabinet. We couldn’t help thinking the smug-faced doll had smashed cracked-faced doll’s head against the glass and now she is forever smiling at the damage done. Perhaps the wax dolls once had sweet faces but I still can’t help thinking there must have been some traumatized little girls on Christmas days of yore! And what’s going on with the doll in the box? Is she an Ophelia doll?? And this one. Ahhhhh. The eyes. Ahhhhhhhhhhhhhhhhhhhhh! 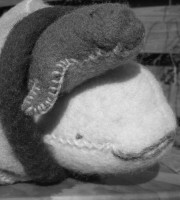 This entry was posted in Marie-Louise Fitzpatrick, Michael Emberley and tagged dolls, The Pollock Toy Museum by The Belugas are Watching. Bookmark the permalink.